So my tactic for dealing with the stress of the upcoming nuptials is to try to have as normal of a routine as possible. This means going to the office for a couple of days of work. This way my head stays clear during the day. However, the problem arises when I get home because this is when I can start doing the bulk of what is on my task list for the wedding…and that can be overwhelming when there are last minute work deadlines to deal with, client calls, and then in the limited hours before sleep, trying to cram in some work for the wedding. Anyways, as I sit right now in my office done with the few things that were on my to-do list for Tuesday (3 client conference calls, interviewing a job candidate, an editorial deadline for a review article, and a deadline for a research survey), I can finally take a deep breath. And that is when a mix of joy and panic sets in. I’m taking the days on either side of the wedding off, so this is my last day in the office without a ring on my finger. In fact, THIS IS MY LAST DAY IN THE OFFICE WITHOUT A RING ON MY FINGER!!! OMG, I’M GETTING MARRIED. IN THREE DAYS! And then the extra panic starts to set in–the “festivities” actually start on Thursday when the out-of-town guests start arriving in the morning. And THIS IS IN JUST TWO DAYS!! And suddenly, everything that I had been procrastinating on because of work (haircut, ironing, food shopping, cleaning the fishtank, doing the windows, sweeping the patio, making a wedding disco playlist, WRITING VOWS, etc.) needs to get done in THE ONE DAY WE HAVE LEFT before the out-of-town family arrive en masse at the flat. ARRGH! In between obsessively looking at the weather forecast (in not one or two, but on three different sources), I have found some moments of peace by taking time out to obsessively troll Gumtree ads for cute puppies for sale. These darlings below are two of our favorites so far. So advice or anyone planning a wedding: Every time you get too stressed out from all the wedding work, just take a puppy break. This entry was posted in Family, Key Events, Reflections, Uncategorized by donny. Bookmark the permalink. Donny, congratulations to both of you. My recommendation (having done this almost 1 year ago) take a moment to enjoy the day. Take a walk with Chris before the whole thing starts. It goes by quickly and you can miss it! 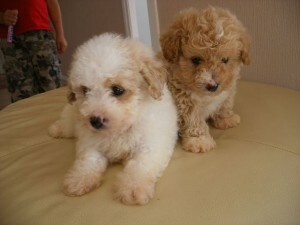 Oh…and the puppies…they look like schnoodles, and we have one…he is the best!